Notes: Based on the manga "Mizuiro Jidai" and "Shin Mizuiro Jidai" by Yabuuchi Yuu. Both series ran in Ciao magazine. Kawai Yuko is an ordinary girl who is just entering middle school. This series details the ups and downs of school life for Yuko, her best friend Takako, her next-door neighbor Hiroshi (who it seems both Yuko and Takako have crushes on), and various other characters. This series is probably known best for Sakamoto Maaya's role as one of Yuko's friends, Natsumi. Indeed, it was her first role before playing Hitomi in The Vision of Escaflowne. I saw this series partly because I'm a Maaya fan and wanted to watch her first role, and partly because I like the story. Mizuiro Jidai has been compared often to the American TV show "The Wonder Years". Indeed, it does seem that way sometimes, with the same slow pace and focus on growing up. Fortunately unlike "The Wonder Years", you don't hear an adult Yuko narrating often. At first when I watched the first episode I thought this was going to be "1996's answer to Kokoro Library" in terms of the pacing and the OP, which sounds like Muzak, but oddly I found myself really caught up in Yuko and the rest of the characters and found myself enjoying this anime. 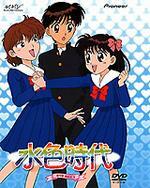 As with most romantic shoujo anime, there is a love triangle between Yuko, Hiroshi, and Takako that later develops into a love square. The seiyuu pretty much do a decent job, and it's fun to hear Sakamoto Maaya in her first role, where she sounds a little unsure about this whole "voice-acting thing". The animation is all right for 1996, and the art style is your standard Ribon/Nakayoshi/Ciao big-eyes shoujo style. Unfortunately, the OP and ED sound like songs from the 80s rather than 1996 and as I mentioned above, the OP sounds like your typical Muzak that you would expect to be piped over in a movie theater while you wait for the movie to begin. But the OP and ED do suit the anime well. In short, I really liked Mizuiro Jidai and it deserves to be licensed, and seen by more shoujo fans. Although most current anime fans probably wouldn't like the slow pacing and the lack of fancy special effects, the story is enjoyable and I liked the characters. It's not a groundbreaking anime, but it works. Recommended Audience: There isn't anything inappropriate in Mizuiro Jidai (this anime is targeted to really little girls, after all), although some young kids might get bored.